I’m taking part in a little competition with Look Again to create a room refresh for under £750 using their products. I thought I could look at a bathroom refresh as we’re just about to paint ours, or maybe our main bedroom which needs a little life breathing into it, but actually with the summer approaching, and having tidied it up yesterday, it would be good to see what I could do for the garden. We have a relatively traditional garden I guess, with areas for the children to play, and areas for relaxation and entertaining. I did a big garden update last summer, and so far the plants seem to have survived the Winter, and it’s looking ok for this summer too. There’s still a bit of work to do though. There’s always work to do in the garden isn’t there? In my head, this is how the garden looks! It’s not quite like this, but we do have lots of these elements. 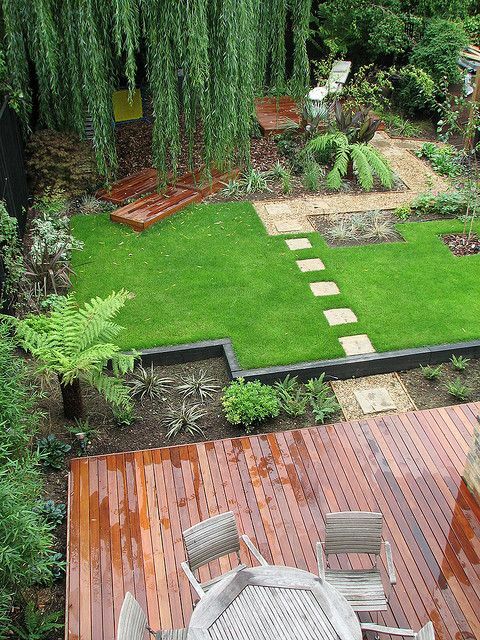 The deck, the grass, some contemporary plants and a play area for the children at the bottom of the garden. Ours just looks a lot older. – Storage is a big problem currently and I’d love to sort this out. I’m really pleased with some of these products. Love the bench particularly, and the gardening tools will make a real difference to how we look after the garden. The extra lawn mower storage shed would be fantastic and I have just the spot to put it. The pizza firepit and lighting will be great on a warm Summer’s evening, and the extra fruit trees will really please the children. All of these products come to under £750. I know it’s not a huge budget but it’s not small either. Updating a space like the garden takes a lot of money, and one of the ways I tackle it, is to do a little each year. Look after what you’ve already created, and build upon your designs and scheme every season. Creating something stunning on smaller budgets takes a little imagination and patience, but it can be done. What do you think of my garden update ideas? This is an entry into the Look Again room refresh competition. I think improvements in a garden, are so costly. You’ve chosen some really lovely things. A pizza fire pit, sounds amazing, love that idea. Thanks, yes I agree. A few hundred pounds and you hardly see a difference! The kids would love that firepit!